Welcome to Killer Doormats! Custom door mats for everyone. Personalized doormats are a great gift for neighbors, newlyweds, house warming presents or the hard to impress man or woman in your life. Our custom doormats are hand painted and made for the geek, chic, rude and crude. You may even find something normal for those who are of a less extreme persuasion. Our custom doormats will make your entrance way create a chuckle or raise an eyebrow. Hit us up if your needs are more custom; we can be reached by email at info@killerdoormats.com. As a small business, we will do our best to be competitively priced. Variations on pricing will be based on many factors such as the effort involved in the custom mat and amount of paint used. Natural coir doormats are the best choice. Shoes are meant to keep dirt out, why bring dirt in? Our custom, hand painted doormat are made with eco-friendly coconut coir. Coir fibers are strong and can last for years with proper care. 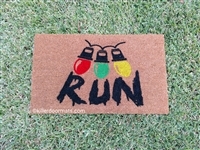 All of our rude and funny doormats are made from coir fiber. We use all weather formulated paint on our custom mats to ensure a long lasting impression of the funny, ironic, chic, rude, unwelcome or mean sayings we have on your personalized doormat. We have a variety of natural coconut coir mats for you to choose from. Our colorful coco doormats will make all your guests feel welcome or jolly and are easy to clean either by shaking, sweeping or hosing down. Besides our personalized doormats being a funny sign at your entrance, they are also very functional, as they are durable and very effective at trapping dirt. 2 for 1 Boo Ya! !